Hugh Jackman, as the title character in Wolverine, menaces his evil brother, Sabretooth, played by Liev Schreiber. Grrrrr. Photo: James Fisher. 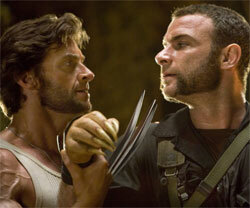 Interfaith actor Liev Schreiber, 41, co-stars as the mutant Sabretooth, a bad guy who is Wolverine’s half-brother. Schreiber, too, really buffed up for his role. Peet married her husband, Jewish screenwriter and novelist David Benioff, 39, in a Jewish wedding held at the Friends Academy. There are fewer than six degrees of separation in Hollywood. In September 2007, I wrote about the scandalous break-up of the marriage of TV news journalist Paula Zahn. Last week, the New York Daily News had a story updating the Zahn marriage saga. Zahn, 52, has been married to millionaire New York Jewish businessman Richard Cohen for 22 years. Zahn, a former beauty queen, isn’t Jewish. However, she and Cohen, 53, are raising their three teenage children in their father’s faith. When they first separated in 2007, the pair traded ugly charges about money and infidelity through press agents in the public sphere. Both parties engaged high powered lawyers and cross-filed for divorce. Zahn filed a separate suit against Cohen demanding an accounting for the $250,000 she had invested with Cohen. The accounting lawsuit has been dropped and Zahn and Cohen have completely reined in their respective lawyers. The Daily News says that Zahn felt she could talk to Cohen directly and that the legal battle was hurting their children. His plea prompted her to seek treatment at a rehab facility near her home in Washington, D.C. “I needed help–I begged God in heaven to help me figure this out,” says Carter, now sober for nearly 10 years. Carter, who isn’t Jewish, was born in Phoenix, Ariz., to an Irish-American father and a Mexican and Spanish mother. A talented musical performer, Carter has revived her singing career in the last few years. In 2005, she appeared in the London production of the musical, “Chicago.” In 2007, she toured a cabaret act around the country. Carter married Jewish attorney Altman in 1984. In 1992, Altman was swept up in the scandal surrounding the financial collapse of the BCCI bank, which was based in Europe. Altman was indicted and charged with helping BCCI secretly and illegally purchase an American bank. Altman’s defense was that he was duped by BCCI’s management. A jury eventually acquitted him on all charges. Carter stood by Altman during his legal troubles. She was a fixture at the courthouse during his trial. Before and after each day’s trial proceedings, she would tell reporters gathered on the courthouse steps that her husband was innocent. When court was in session, Carter would plant herself in the visitor gallery in the seat nearest the defense table. In all seriousness, it was a rather touching demonstration of spousal love and one can reasonably speculate that Altman returned the favor as Carter battled alcoholism. After his acquittal, Altman signed a civil agreement with the government not to work in finance again and he now heads-up an entertainment company. Apparently, Carter and Altman’s children are being raised Jewish. I found a reference to the bar mitzvah of their son, Jamie, in 2001.